Credit Crunch All Over Again! It smells like crunch time to me, the markets have flattened or begun to even roll over on continuously decreasing volume. The economy has also turned down all over the world including in China. Europe is contracting, Britain has finally figured out their finances are FUBAR and the U.S. would not show growth if not for the biggest inventory build in history. Oil tankers are sitting idle (and full) all over the world, is this a sign of “recovery” or of stagnation. The Baltic Dry index is plumbing news, this would be a sign of what? When I wrote crunch time above, I should have clarified, it looks “credit” crunch time and this time there is no white knight to save the day. Zerohedge penned an article Monday where even Citigroup talks about this lack of liquidity. After years of massive deficit spending and quantitative easing amongst the major central banks of the world …liquidity is drying up! 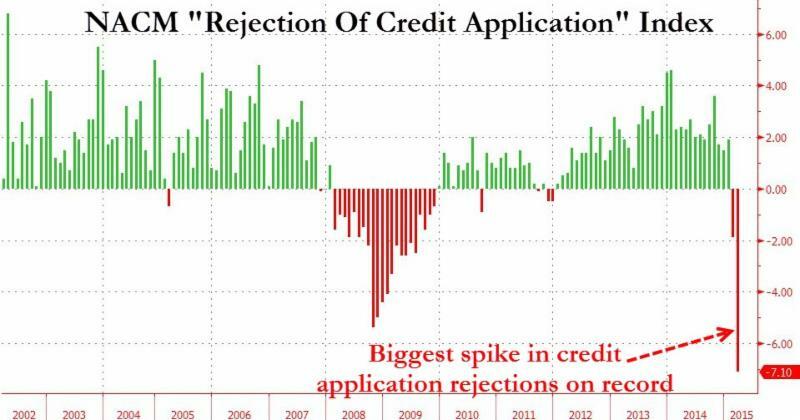 Credit requests are being turned down at a record pace. This is just one aspect of liquidity being withdrawn but look at the “speed” that it is happening, and the depth or magnitude compared 2008. In an effort to reflate, again, sub prime loans are being packaged and gobbled up. “Government Using Subprime Mortgages To Pump Housing Recovery – Taxpayers Will Pay Again”. Not because they are rated “AAA”, no, this time because they provide “yield”…ANY yield. It doesn’t matter whether they default or not …they “yield” something now, right now! The obvious question then becomes “what bullets are left” by the Fed to reverse the collapse this time around? The real and short answer is “none”. The above chart is just one of the real economy, the real problem is if a chart could be constructed of “derivatives losses”. This one would be a doozy and the reaction would be an immediate and global panic. We won’t be able to see a real time chart until after the fact, we can’t see behind the curtain because that would create a panic on its own. I know I have written about this aspect before, the “truth” must be hidden at all costs, it is important because it is the last line of the defense of “confidence”. Greek bonds, even though default is imminent CANNOT in any way be marked to true value. Ratings services are already hinting at and devising ways to not recognize nonpayment by Greece as something other than a default. In what world is nonpayment not a default? Would your bank believe YOU if you didn’t pay …and then said “don’t worry, I didn’t default”? I showed you a chart yesterday of Chinese shipping container activity, this was followed by the largest trade deficit ever by the U.S.. NOT because we are importing more but because our exports are drying up. A sure sign the strong dollar is beginning to bite and trade overall is slowing. The expansion of the trade deficit guarantees a negative 1st Quarter GDP even after bogus pie in the sky reporting. As Zerohedge put out yesterday “QE4 is coming”. I say QE4 will absolutely tank confidence because we have already taken more than “three strikes”! Confidence by the way has been the very last vestige and has been used, re used and overused, QE4 will expose this. Please understand the connections I am making here, it is not just the real economy nor just the financial markets, it is both …and at the same time. This is 2008 all over again except much larger, far reaching and more severe. The markets are far larger than the central banks collectively, call this Dr. Frankenstein and his monster if you will. The real economy is no longer generating enough cash flow to service the debt hung around its neck … while the financial sector hangs on by the thread of “non” mark to market. The truth cannot come out and no, truth will not just hurt us. On the contrary, the truth will outright kill the system(s) as we knew them. Do not fool yourself, do not “hope” I am wrong. Get yourself into a financial bunker lined with gold and “lose” as little as possible when the system comes down because most of what is not inside your bunker and outside of the system will be “re appropriated” shortly. No one and no central bank will, nor has the ability to come to your rescue this time around! Best described, it will be every man for himself. The writing on the wall is plain to see Bill, for anyone to read! With the ability to comprehend and to accept what the message is saying. And yet, there still those that refuse to “see” or even “read” the message on the wall! They will all fall by the wayside. The “crunch time” comes ever nearer. Getting close now. they don’t “see it” because we are in a “recovery”. The only thing up is inventories! I appears the 1% is Winning. Political process owned by the 1%. A population whose money supports Jade Helm 2015. Families being torn apart and children educated by the system. yes you left a lot out but it all goes to the same end. If gold is money (and history proves that it is) and someone install same savings interest rate for gold deposit as for i.e. EUR everybody would want to have savings in gold. Isn’t that correct thinking from my side? – I would prefer gold to EUR. I wander what is your opinion of gold deposit bank (some exist in India and Turkey)? I believe if some bank starts to give some interest rate (paid in gold) on gold deposited by customers – even tiny. All the other (fiat) banks are empty very fast. And they will fight such a bank. BullionVault, GoldMoney and similar are ok with big banks, as they actually charge you a fee to hold your gold with them – effectively that is negative interest rate. Do you agree? What is your take on that. Do you believe things will deteriorate so far that people will want to deposit gold on their deposits? But for now I must agree with a guy that says that 1% is wining all the way. I agree in principle but you must wonder about the “return” of your gold? Such gold bank should only do what? They even can not lend gold 1:1, as they have counterparty risk. If they exchange it for fiat they may have huge balance sheet mismatch as gold rises. That means total economy halt! What can “honest” banks that may emerge do with gold deposits? I believe they have such problems in India and may be somewhere else also. Do you see a rational solution to that? Can be that gold standard is not working for the economy? Is bank lending unnecessary and fraudulent in “honest”, “human” economy? Should economy really completely collapse? there must be a rule of law that applies to everyone, there is not nor does it. As I understand, banking as it is – is unlawful, unacceptable under gold standard? Please correct me if I am wrong? But it is also unworkable in gold standard! As leverage is unacceptable and counterparty risk too high in full gold standard. I just want to say that Maybe gold standard is not the best idea, solution. It may put economy in immediate halt and hurt people even more as they are already. wait until the collapse, you might change your mind. I believe the result will be some sort of gold ratio backing. I completely agree with your assessment Bill. I am just one little guy in an ocean of humanity, but QE4 and/or continued ZIRP will only cause me to circle the wagons even tighter. When a fighter jet has lost it’s power and three attempts to restart the engines have failed (i.e., QE 1,2, & 3), it’s best to punch out! Otherwise you’re going down and the outcome is certain. yes David, that’s a good’ern! Bill, can my bunker be lined partly with silver? China gold fix coming ? they will arbitrage the West dry. Had to go to Home Depot for new hot water heater and stopped by Walmart for groceries (just hate to waste a 40 mile drive) both stores near empty at middle of day. count your blessings gig! If you live in the U.S., the “skinny” hot water heater you just bought will be “illegal” in 10 more days …requiring you to cut a much larger hole to fit the new and “legal” hot water heaters. What a joke if it was not such a scam! who you gonna believe? Me or the pictures? Are you gonna believe your lying eyes or resident obola and Wall Street ? many things coming together at one time, they will already be in place when it does. Bill, I agree with your summation if we were existing in a real world where price discovery exists. The Fed and TPTB have taken discovery away from the markets. Why would the market not embrace more QE? Stocks go up, propaganda continues and all are lead to believe things are better for it. It seems to me that things will not change until pubic sentiment changes. With all the propaganda from the networks and newspapers, that may take a long time. not very long in my opinion, things coming to head from many directions.